Neil Lennon feels Hibernian's recent performances have not yielded the results they deserve, and hopes that will change against Hearts on Tuesday. Hibs drew with Celtic and lost to Aberdeen in the Premiership. And they lost the League Cup semi-final to Brendan Rodgers' side at Hampden on Saturday. "We've had Celtic-Aberdeen-Celtic in the last three games and we've performed very, very well in all the games," Lennon said. "I don't think we've got what we've deserved for the performances and quality of football that we're playing." After falling 2-0 and then 3-1 behind to Celtic at Hampden, Hibs pushed the holders all the way before a late Moussa Dembele goal, to make it 4-2, finally ended their resistance. Lennon says his players have already bounced back from the defeat. "I don't think they've needed that much lifting because in the main we've played really well, particularly second half," he explained. "Just a few little things we need to do better in the game against opposition of that calibre. But they have nothing to berate themselves for. They've just got to go again. "The atmosphere seems good this morning. It's a derby, it means a lot to both sets of supporters and the players are well aware of that." 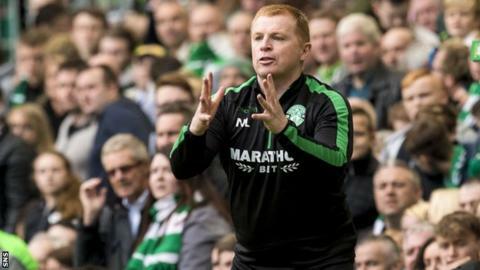 Lennon is wary of the threat of a Hearts side that appears to have more steel under Craig Levein than they did under his predecessor, Ian Cathro, and believes Hibs are ready for the physical battle heading their way at Easter Road. "It'll be feisty, I'm sure. All derbies are," Lennon added. "I expect tomorrow night to be exactly the same. "Saturday at times was physical between two teams that try and play football. You have to earn the right to play. That's the message I always say to my players. We try to do that every week. "We played strongly last year in the two games [against Hearts] and we'll have to play strongly again. It's a different Hearts team now with maybe a different mindset. Obviously they've got Craig in who's got vast experience and they're starting to pick up some results. "It's important we take the game to Hearts whenever we can. We're at home, the onus is on us to take the game to them and that's what we intend to do. "We've set a really good standard even though we probably haven't got what we deserved. Hopefully that's going to come, and it would be nice if it comes tomorrow night."